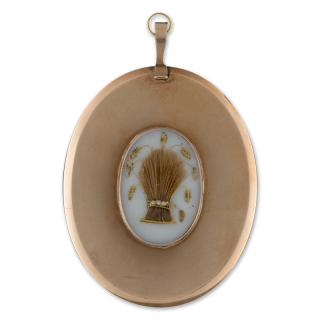 This miniature, painted in 1802, dates from the height of John Smart the junior’s brief career as a miniaturist, that was tragically cut short by illness in 1809. He had been trained by his father – one of the leading miniaturists working in eighteenth-century England. Born illegitimately to his father’s lover at the time, Sarah Midgeley, Smart was one of his father’s six children over the course of three marriages. When his father went to Madras in 1785, the nine-year-old John and his four-year-old sister were left in the care of the miniaturist, Robert Bowyer, who arranged for their education. Having exhausted his potentials abroad, Smart senior returned to London in 1795, effortlessly resuming his life of ten years earlier. By this point, his son – by now twenty – had matured into a competent young artist. His father, doubt proud of his son’s achievement, decided to train him in the arts of miniature painting, as is attested by a number of highly-accomplished copies after his work dating to this time. 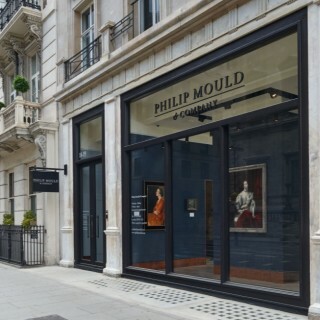 From 1800, he began to exhibit his work at the Royal Academy; registering his address as 2 Russell Place, his practice was closely tied into that of his father, with Smart the younger seeking to make a particular specialism of his works in paper and card. In 1808, his father petitioned the East India Company to invite his son to Madras in India, where he hoped that he would be able to find patronage among the wealthy mercantile and administrative classes there, as he himself had done before. Pleased with his son’s artistic prowess, Smart the elder writes in the petition of his hopes that his son would do ‘honor to me and credit to himself’. Tragically, however, Smart junior was not to have an opportunity to prove his talent. Within four months of his arrival, he had died, perhaps succumbing to one of the tropical diseases to which Westerners in the Subcontinent were so prone. Certainly, his illness seems to have developed rapidly, as only one surviving miniature can be dated to this period in his life. His heartbroken father died only two years later. Although the sitter of this portrait has historically been identified as Louise Adélaïde de Bourbon, given the age of the sitter it could possibly instead be of her second cousin once removed, Adélaïde d’Orléans. As members of the royal family, both women were put at great danger with the revolutionary insurrection in France that began in 1789. For nobles of their status, the stakes were very high indeed. Louise Adélaïde’s second cousin and Adélaïde’s father, Louis Philippe, Duc d’Orléans, was the Premier Prince du Sang, meaning that he was the closest to the royal family beyond the immediate sons and grandsons of the King of France himself. A canny political operator, he had sought to ride the wave of revolutionary change in his favour, changing his name to Philippe Égalité and breaking his word to vote in favour of the death of the king in the National Convention. Despite these impeccable revolutionary credentials, however, the very fact of Philippe’s lineage made him suspect in the eyes of the revolutionaries and in 1793 he himself was sentenced to death by guillotine and executed in front of a baying crowd. For both women, this meant a total disruption of their lifelong expectations. Louise Adélaïde, a daughter of the Prince de Condé, who had once been courted by Charles, Duc d’Artois, fled to Belgium at the first signs of upheaval, leaving behind the magnificent Hôtel de Bourbon-Condé that she had had built. By 1802, she had given up on the prospect of making a marriage to a high-ranking French aristocrat and took the veil in Warsaw, Poland. 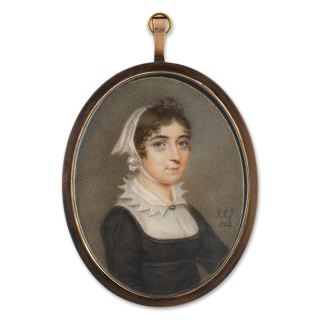 It could be that this miniature, painted in the same year, was made to commemorate this momentous occasion in her life. When she returned to Paris in 1816 following the Bourbon Restoration of 1814, she founded a religious institution to which she dedicated herself in the years until her death in 1824. Presciently fearing for the safety of his family, Philippe Égalité had his daughter Adélaïde d’Orléans sent to England in the early years of the Revolution for her safety. Accompanied by her governess Madame de Genlis – a pioneer of Enlightenment notions of female education – she stayed in England for two years, before being summoned back to France by her father who hoped to prevent her from being added to a list of enemies of the Revolution. When she arrived, it soon emerged that she had been added to the list regardless and was in great danger in the French capital; after a no doubt emotionally-fraught farewell with her father, she once again fled Paris and spent the remaining years until the Restoration moving between various European cities, eventually settling in Palermo. In these same years, she developed a love of horticulture that she expressed – thanks to her artistic training by Pierre-Joseph Redouté – in her accomplished works of botanical illustration. Her name is remembered in the strain of rose that was named her. Following the Restoration, she was instrumental in persuading her brother, Louis Philippe, to present himself as a staunch opponent of the absolute monarchy of Charles X, favouring instead a constitutional monarchy. When following the revolution of July 1830 Louis Philippe was presented the crown by the French people, Adélaïde became Madame Adélaïde, serving as her brother’s loyal adviser. She did not live to see the end of what became known as the “July Monarchy”, dying two months before her brother’s abdication in the wake of the revolution of 1848.